1. The less you open your heart to others, the more your heart suffers. 2. If you create any open space within yourself, love will fill it. 3. Love doesn’t need reason. It speaks from the irrational wisdom of the heart. 4. Love is the beginning of the journey, its end, and the journey itself. 5. The reason that ego and love are not compatible comes down to this: you cannot take your ego into the unknown, where love wants to lead. If you follow love, your life will become uncertain, and the ego craves certainty. 6. Therefore the path to love isn’t a choice, for all of us must find out who we are. This is our spiritual destiny. The path can be postponed; you can lose faith in it or even despair that love exists at all. None of that is permanent; only the path is. 7. Up to the point when they merged, two lovers walked separate paths. Together they create a new path that has no past, where every step moves into the unknown, and no amount of experience can light the way. 8. Negativity is born in the gap where love has been excluded. 9. Asking for love is one of the most difficult things for anyone to risk, and by risking it first in your heart, you open a door that will never close again. 10. The energy born of love is creative – it makes everything it touches new. To see how passionate you are, look around at what you have created. 11. It isn’t love when another person cannot give you the space to live your own life. 12. People who feel loved live longer; have fewer colds, lower blood pressure and lower cancer rates; and have fewer heart attacks. 13. Love is never about possessing but letting go. Excerpt from Wikipedia: Deepak Chopra (Hindi: दीपक चोपड़ा; born October 22, 1946) is an Indian medical doctor, public speaker, and writer on subjects such as spirituality, Ayurveda and mind-body medicine. Chopra began his career as an endocrinologist and later shifted his focus to alternative medicine. 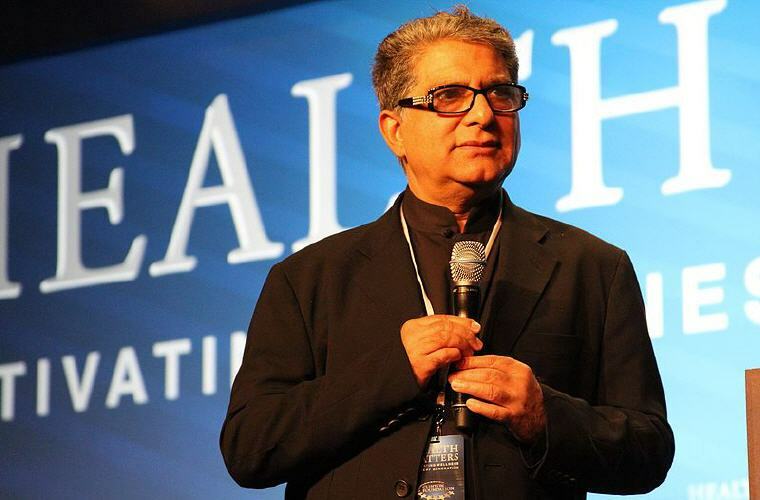 Chopra now runs his own medical center, with a focus on mind-body connections. He is also a lecturer at the Update in Internal Medicine event, sponsored by Harvard Medical School’s Department of Continuing Education and the Department of Medicine. 1. You have to take life as a joyful adventure and an adventure that is part of a greater, bigger love story. 2. There are no extra pieces in the universe. Everyone is here because he or she has a place to fill, and every piece must fit itself into the big jigsaw puzzle. 3. So see today as the beginning of the future, not the tail end of the past. 4. Whatever relationships you have attracted in your life at this moment are precisely the ones you need in your life at this moment. There is a hidden meaning behind all events, and this hidden meaning is serving your own evolution. 5. You and I are essentially infinite choice-makers. In every moment of our existence, we are in that field of all possibilities where we have access to an infinity of choices. 6. Our thinking and our behavior are always in anticipation of a response. It is therefore fear-based. 7. The way you think, the way you behave, the way you eat, can influence your life by 30 to 50 years. 8. Whether you like it or not, everything that is happening at this moment is a result of the choices you’ve made in the past. 9. But if you and I are having a single thought of violence or hatred against anyone in the world at this moment, we are contributing to the wounding of the world. 10. Nothing is more important than reconnecting with your bliss. Nothing is as rich. Nothing is more real. 11. The physical world, including our bodies, is a response of the observer. We create our bodies as we create the experience of our world. 12. Our thoughts shape our perceptions. Our perceptions shape our reality. 13. Every time you are tempted to react in the same old way, ask if you want to be a prisoner of the past or a pioneer of the future. The past is closed and limited; the future is open and free. 14. You will never feel better about yourself by making others look worse. 15. When you struggle with your partner, you are struggling with yourself. Every fault you see in them touches a denied weakness in yourself. 16. Questions answer themselves if you are aware enough. 17. The first step toward change is recognition. Recognize that you have had at least a few hopes and wishes come true. 18. For the moment, take a little time every day to notice the contents of your mind. This act of noticing, although very simple, is one of the most powerful steps to bringing about change. What you don’t see you cannot change. 19. Giving connects two people, the giver and the receiver. This connection gives birth to a new sense of belonging, not the passive belonging of the baby who automatically belongs to the mother but the active belonging of someone who has learned to create happiness. 20. Every coincidence becomes an opportunity for you to become the person the universe intended you to be. 21. Everything is connected with everything else. In the spiritual world, those connections become visible. But in the physical world, we only glimpse the connections in the clues given to us through coincidence. 22. You must find the place inside yourself where nothing is impossible. 23. When you blame and criticize others, you are avoiding some truth about yourself. 24. We must never pretend appreciation, but if we feel it, then we must express it. 25. When we seek money, or a good relationship, or a great job, what we are really seeking is happiness. The mistake we make is not going for happiness first. If we did, everything else would follow. 26. The expression of gratitude is a powerful force that generates even more of what we have already received. 28. No single decision you ever made has led in a straight line to where you find yourself now. 1. The secret of attraction is to love yourself. Attractive people judge neither themselves nor others. They are open to gestures of love. They think about love, and express their love in every action. They know that love is not a mere sentiment, but the ultimate truth at the heart of the universe. 2. In the midst of movement and chaos, keep stillness inside of you. 3. If you want to reach a state of bliss, then go beyond your ego and the internal dialogue. Make a decision to relinquish the need to control, the need to be approved, and the need to judge. Those are the three things the ego is doing all the time. It’s very important to be aware of them every time they come up. 4. The possibility of stepping into a higher plane is quite real for everyone. It requires no force or effort or sacrifice. It involves little more than changing our ideas about what is normal. 5. No matter how much of a mess we may have made of our lives, it is always possible to tap into the part of the soul that is universal, the infinite field of pure potential, and change the course of our destiny. 6. We see the world through the mirror of our own being. 7. Be happy for no reason, like a child. If you are happy for a reason, you’re in trouble, because that reason can be taken from you.